This started as me watching a movie with my two-year-old son, and it ended with me finishing by myself. I had started this once and abandoned it thirty minutes in. Perhaps it is because I watched much of this with a two-year-old, but I am glad I did take the time to take this to the end. It actually is fun once it gets going. I watched MADAGASCAR (2005) on 5.26.13. It was my first viewing of the film. A lion, a giraffe, a hippo, and a zebra leave the safety of the zoo and end up in Madagascar. They are aided by penguins and lemurs and they try and make sense of their new, less cushy, environment. This is an easy enough source for some hilarity. 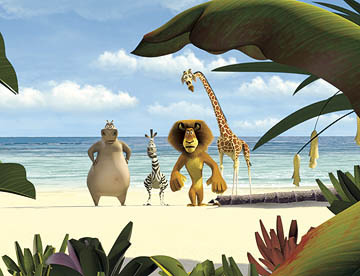 The animated animals are voiced by comedy heavy-weights like Ben Stiller and Chris Rock and the original, as you probably know, has spawned sequels and TV shows. I appreciated the referential humor in this. The lion has a ball named Spalding instead of Wilson. When his statue-of-liberty type beacon burns down he crawls on the beach and screams similar lines to Heston in PLANET OF THE APES. The boat which lands them unintentionally on Madagascar is called the SS Act II because, well, it launches the movie into its second act. It’s all fairly cute and innocent. It’s sometimes crude like SHREK, but mostly just harmless. This is fairly safe kid-type fun even if it isn’t quite as fully rewarding for adults. The first time I started this, probably a few years ago, I got to the point when they were on the boat and gave up. I found the characters less defined than the Pixar stuff and less funny than the Ice Age series. I just wasn’t roped in. This time, though, the addition of a two-year-old helped me stay engaged in the silly hi-jinx of the animals. The movie doesn’t really going until the second act, when the animals start interacting with the wild, so I abandoned ship too early. From there the movie is quickly moving and consistently funny. While I won’t see be rushing out to the follow-ups, I won’t avoid them either. I don’t have much else to write about this because, well, its pretty much all just on the surface there. This isn’t WALL-E, but it kept me entertained. As a reminder, when ranking an animated film, ACTING considers the quality of the voice work and the job the animators do in displaying character. ~ by johnlink00 on May 26, 2013.